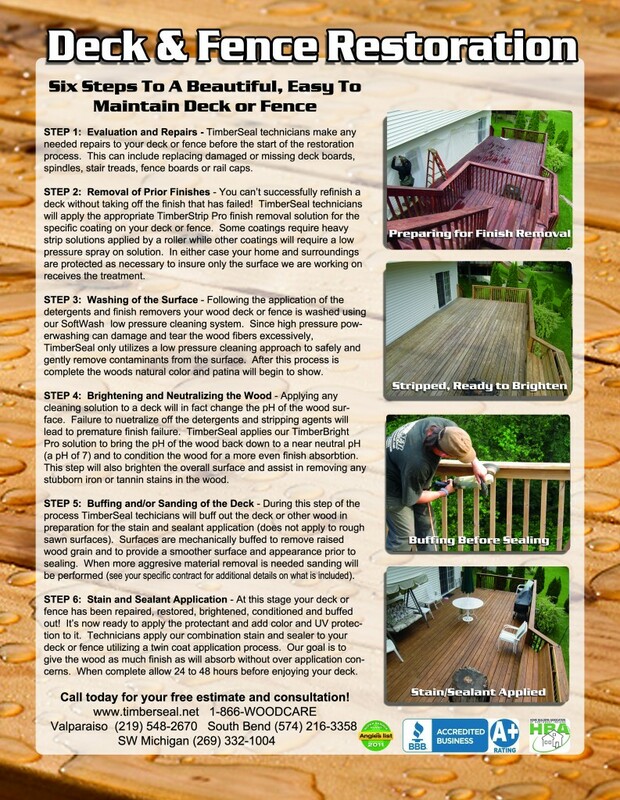 The first step in restoring your deck, log home, or other wood structure is the evaluation process. It’s with this that we are able to determine exactly what your project needs in order to restore the natural beauty back to it. During this process we provide consultation, obtain dimensions, and record the overall condition and finishes presently applied. We also bring before and after photographs of previous projects we have completed, samples of the natural finishes we offer, and your guaranteed price! Depending on the present condition of your wood structure, this step will consist of finish removal and/or a deep cleaning of the wood. If a recent finish has been applied (usually less than 2 years old) your wood may have to be stripped of the prior coating. Some coatings remove quite easily while others may require multiple steps for removal. If a finish does not exists on your wood, a deep cleaning is initiated in order to remove the mold, mildew, dirt, and general fallout that collects on the surface. The graying is also removed during this process to reveal the natural look of the wood. One of the most important steps of the entire process is the neutralization of the cleaners and agents previously applied. This provides a neutral pH for the wood as well as removes stubborn tannin staining. This is accomplished through the use of our specially blended brightening agents and the strength can be adjusted on a per job basis. After application and a short dwell period a final rinse of the entire structure is done. This solution also imparts a mildew inhibitor to wood surface as an additional measure of protection UNDER the finish. After all of the cleaning and restoration portion of your project is completed your wood needs to dry out. This process can vary depending on the season and overall weather conditions. Typically we require two to three dry days before sealing is initiated. The moisture content should be no more than twelve percent when sealing and will be confirmed before the next step. A crucial step before the sealant application is in the detail work. All agreed upon repairs are made to your structure and the it is then thoroughly inspected for “furring” or splintering. Sanding is performed as deemed necessary to insure a splinter free atmosphere. Caulking, chinking, and borate applications are also performed in this phase of the process if the project requires so. The final step and most gratifying is the sealing of your wood. After confirming the moisture content in the wood we perform the necessary setup to begin sealing. Through the use of our application system we provide exactly what your wood needs in order to last a lifetime! Every wood project differs in the amount of sealer needed for proper protection. This is determined by the past maintenance, species, and age of the deck. Our technicians will apply your chosen finish to meet the standards we have set as well as the manufacturer of the finish. 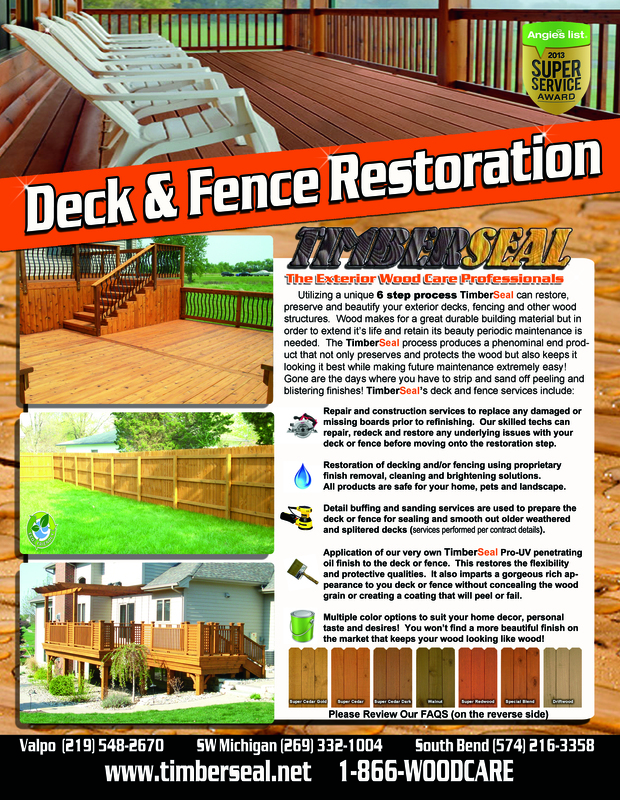 Proper preparation and application is the key to longevity in a wood finish. There you have it! Call us today at 1-866-WOODCARE for aTIMBERSEAL, LLC representative to assist you in your wood restoration project. We bring Excellence and Dedication to every job we do!